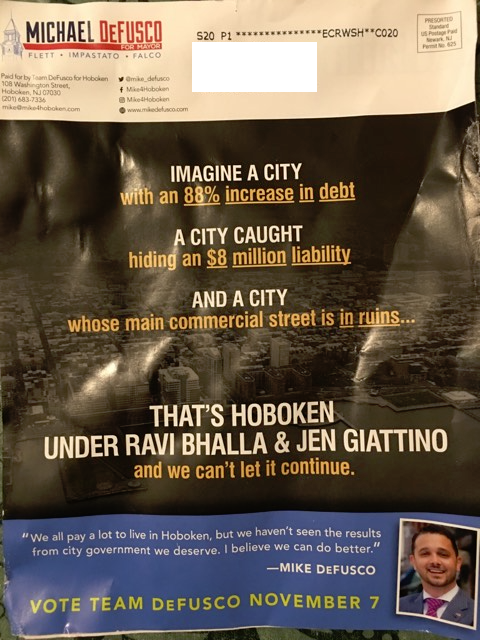 Many will have seen the latest mailer from Councilman Mike DeFusco in his last ditch bid to see the Big Lie technique fool voters against his mayoral rivals City Council President Jen Giattino and Councilman Ravi Bhalla. A quick analysis of the attacks features a reference to debt. Councilman Mike DeFusco has supported bonding for infrastructure improvements in Hoboken and to date, those measure weren't considered controversial. He's voiced in bizarre fashion, payments for infrastructure need to be made from the budget. He of course doesn't suggest who he will tax to obtain immediate funding in such a proposal. No one pays for long term capital improvements out of an annual budget. On the $8 million liability, a clear reference to the Suez water debacle, there's a glimmer of truth. The Big Lie deployed here is pointing the finger at other council members on the same body where he himself was kept in the dark by the administration. DeFusco even praised the City Council President Jen Giattino for her efforts to get the council members updates from the administration in a recent meeting on the emerging Suez liability. Politics being what it is in Hoboken, the truth goes right under the bus in short order. It's election time. Hoboken's main thoroughfare is trudging along to nowhere. All work on the Washington St. "detonation" as one council candidate called it was stopped after a pedestrian was struck by a flying object. At the last council meeting, the administration stated work would commence this week. So far it hasn't. Some point to the election as the reason as Mayor Zimmer tries to get her anointed successor Councilman Bhalla across the finish line. Mike DeFusco came up to the council on the good graces of the dying Reform Movement, detonated by the power play Hoboken witnessed last June at City Hall. He sought the support of Mayor Zimmer and was elected with her and the movement's goodwill. He's a dangerous package deposited as a Manchurian Candidate by the Old Guard. DeFusco came up through the Maurice School of Old Guard candidates. In 2011, he worked for the council campaign of Perry Belfiore and opposed not only Councilman Peter Cunningham but publicly supported Terry Castellano against one of Hoboken Reform's most revered figures, Eric Kurta, the Wiley Coyote. Kurta was the de facto leader of People for Open Government and worked to implement ordinances ending pay-to-play and wheeling in Hoboken. He came up short in the 2011 council race against Castellano. Later DeFusco would flip his support from Castellano to advance himself being elected in 2015. Many gave him every benefit of the doubt. He used the Reform Movement and Mayor Zimmer to do so. To be blunt, this is a track record of a "say anything" stab anyone in the back Soprano State politician. DeFusco carries the veneer of respectability, that he is "one of us" but he's one of them, Old Guard to the core. Related: Tonight at 7:00, it's the last mayoral forum with the six candidates at Steven's Debaun Auditorium (fifth and Hudson St.). Mike DeFusco has shown serious preparation for these engagements. He comes with prepared attacks and lines of fire. Often, the truth is the first casualty. Ambition drives some to extremes. Those extremes don't only surface with ambition but in tormented ideological division exhibited often in this non-partisan municipal election with four major campaigns. While some phony political attacks are expected in Hoboken, the exhibitions of the Big Lie, denunciations and conspiratorial personal attacks and refusal to reject political violence has reached epidemic proportions for Hoboken's local and would-be national candidates. Lessons are not being learned. The latest fashion trend is to wrap oneself up as a victim while doing so. No doubt we'll see more of the same in some form tonight with the usual bomb throwing. Character has a way of marking the way and revealing itself. You would think some would know better.